Once upon a time an MP and a few politicians dreamed of a new road. There was only one problem, the road ran through some of the most iconic countryside in the country and across the beautiful water meadows that Sudbury is famous for. The dream of this road persisted, over the course of 40 years, different councillors and MPs backed the idea, a sure vote winner and the solution, they thought, to traffic chaos in Sudbury. They paid different experts to find out what it would cost and what problems building such a road would face. But initially the government said that concreting over iconic countryside was not a price worth paying so it never happened. Then the Government changed and new roads became the new black (as it were). The idea was revisited and more money was spent on more consultants. Finally after many hundreds of thousands of pounds of taxpayers money, the consultants said that the cost of building the road so it did not ruin the countryside, was now so high, the future of roads and transport, so uncertain, that it would never bring enough benefits. The Council who would build it, realised the dream was dead. The councillors who dreamed of driving their favourite car over the new road were angry, but the vast majority of those who expressed either support for, or opposition to, the road, were ecstatic. The Meadows were saved. There would be no bypass. The proposed bypass would have run from the Melford Road roundabout across to Ballingdon Hill. This road would cut straight through a designated Environmentally Sensitive Area, and would damage our landscape irreparably. Habitats and wildlife would be threatened; the ecology of the river banks would be harmed or destroyed and there would be an increased risk of flooding upstream and downstream. The tranquility and beauty of the area would be lost forever. The bypass would also enable residential and commercial development in countryside areas rich in wildlife, which are currently accessible only by narrow country lanes. The roundabouts proposed over Kitchen Hill and at the A131 for example, would open the door to the building of housing estates and other infill developments, and the subsequent creeping loss of our green spaces and wildlife habitats. Sudbury has serious traffic problems, but building a costly bypass is not the answer - new roads are proven to generate more traffic, not less. The Local Authority has not yet tried out any alternative solution to lessen congestion and pollution, despite many suggestions being offered (including: better funded public transport; cycling and walking routes to discourage car use; speed limits in town; emissions zones; HGV weight limits; returning one-way system to two-way; implementing a one-way at Cross St/Church St; re-routing HGVs/LGVs via A120/A12/A14/A134 etc; etc). More than 60% of Sudbury's traffic is local anyway, so would not use the proposed bypass. Sudbury has been promised 'growth' - but do we want our small market town to become just another large town at the expense of its beautiful water meadows? The excellent Daily Telegraph cartoonist Patrick Blower hit the bullseye without even knowing it. 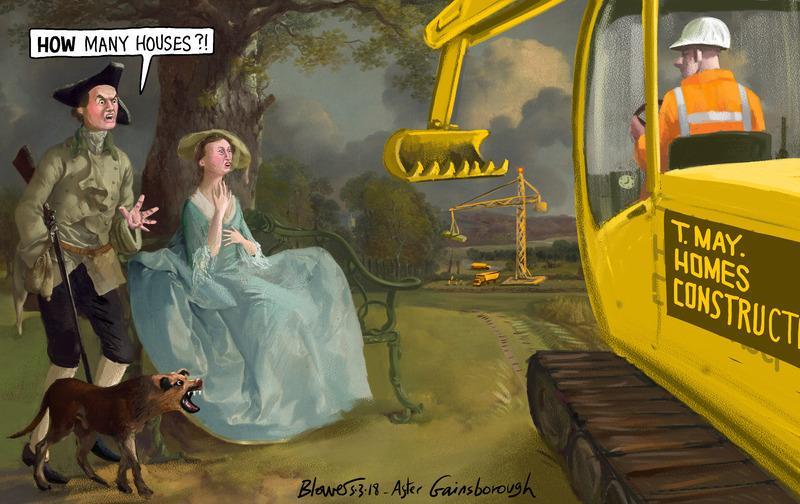 Seeking inspiration for a cartoon about the destruction of our countryside by new waves of housing development he turned to an artist he loves, Thomas Gainsborough and his celebrated work, "Mr and Mrs Andrews” which was painted just south of Sudbury looking across the meadows towards the town. “I thought that this was a landscape no-one would want to destroy,” Patrick told us. He was astonished to learn that Suffolk County Council wants to put a bypass and massive housing estates right through the middle of one of the most famous views in British art. Patrick has kindly sent us a high resolution version of his cartoon. Our Freedom of Information request yielded the following snippet of info. The first drafts of the Options Assessment Report and the Appraisal Specification Report have not been completed yet. Suffolk County Council have asked for further work to be undertaken on Gainsborough painting sightlines which will need to feed in to the Options Appraisal Report. As such the first draft will not be drafted until this work has been undertaken. This of course means that the forthcoming in depth study being compiled by WSP Parsons Brinkerhoff on behalf of SCC and the Suffolk Leaders Group has to take the landscape of the Mr and Mrs Andrews into account in any detailed planning. This seems laughable as it means they consider the landscape portrayed is more important than other parts of the local landscape that would be negatively affected. We now know that the Study should be studying every option aside from a Western Bypass for Sudbury. This snippet from an email about Transport Strategy dated 30th September 2018 explains. Our consultants, WSP, have been busy working on the ‘EAST’ (Early Assessment and Sifting Tool) to inform the Option Appraisal Report. This will give us a long list of schemes, and highlight which ones we should take forward to the next stage for more detailed assessment. We would very much like to share this with you, and will be in touch in due course to arrange another stakeholder meeting, probably in November. A Southern Bypass from A131 Bulmer to Little Cornard to the A134. An Eastern Bypass from the A134 Sudbury-Colchester road to the A134 Melford Bypass. 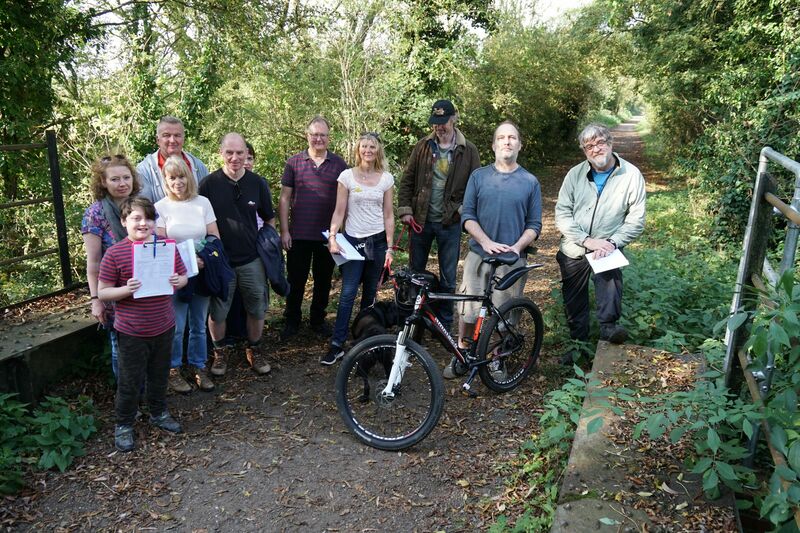 Active Travel plans which aims to get the up to 55% of short trips that make up Sudbury Traffic to modally shift to Walking, Cycling or indeed Electric Cycling. Moving the Strategic Lorry Route for Braintree to Bury St. Edmunds from the A131/A134 through Sudbury to the A120/A12/A14.